The Sharks agreed to a $64 million, eight-year extension with forward Logan Couture, according to a person familiar with the contract who spoke to The Associated Press on condition of anonymity because the deal hasn’t been announced. It can’t become official until after noon Sunday because it doesn’t begin until the 2019-20 season – the same as long-term deals the Los Angeles Kings have with Drew Doughty and Arizona Coyotes have with Oliver Ekman-Larsson and Niklas Hjalmarsson. A person with direct knowledge of discussions said the Buffalo Sabres are expected to sign goalie Carter Hutton, who had been the St. Louis Blues’ backup to Jake Allen. The person spoke to the AP on condition of anonymity because agreements cannot be announced until the signing period begins. 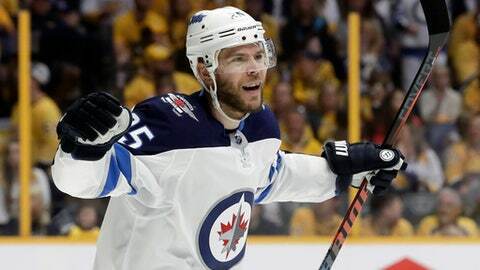 Stastny fit in seamlessly after Winnipeg acquired him from St. Louis at the trade deadline but also might be better served waiting to see what Tavares does. Teams looking for a center who don’t land Tavares will look to Stastny and Toronto’s Tyler Bozak and could look into a trade for Buffalo’s Ryan O’Reilly, who is signed for the next five years and owed a $7.5 million bonus Sunday.